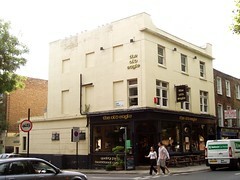 A pleasant boozer around the corner from Camden Road Station. This was clearly once a down-at-heel locals' pub which has been given a makeover. However, there's nothing pretentious or gastro about it. The pub has an open airy feel, with a sunny beer garden area in the back, and what feels like a conservatory under a stained-glass eagle photo with comfy sofas and solid tables (and odd Tutankhamun book ends). The beer selection itself is nothing special: there's Greene King IPA and two guest beers on pump, with a few lagers as well. They do Pimm's jugs in summer, a £5 'House Doctor' bloody mary, and hot toddies and mulled wine in the winter. They also serve Thai food. According to their website as of November 2016, they have a pub quiz on Mondays, live music on Wednesdays, and a DJ on Thursdays; also, they are dog friendly. Ewan's verdict: It may not be a destination for the drinks, but it goes very far with a relaxing atmosphere and pleasant surrounds, far away from the bustle of Camden High Street. Last visited by ilmari, September 2008. Opening hours taken from the Old Eagle website, November 2016. Last edited 2016-11-08 12:11:19 (version 9; diff). List all versions. Page last edited 2016-11-08 12:11:19 (version 9).